Here are some salon business cards we created for our hair and beauty salon customers. 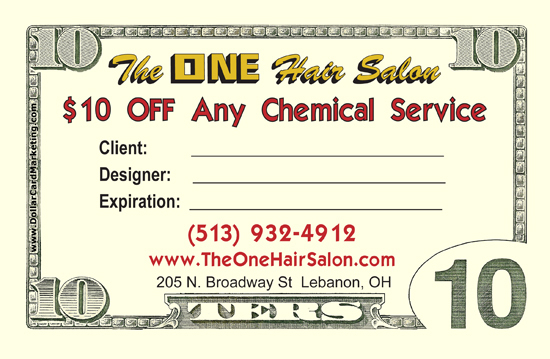 Here’s a set of salon discount coupons that we created for The One Hair Salon in Lebanon, Ohio. They’re using our dollar bill business cards as salon discount coupons where each designer can fill in the appropriate blanks and provide to their customers for a discount on salon services. Here is a set of $5 dollar bill discount coupons we designed for Acappella Hair Design & Color Studio in Temecula, California.